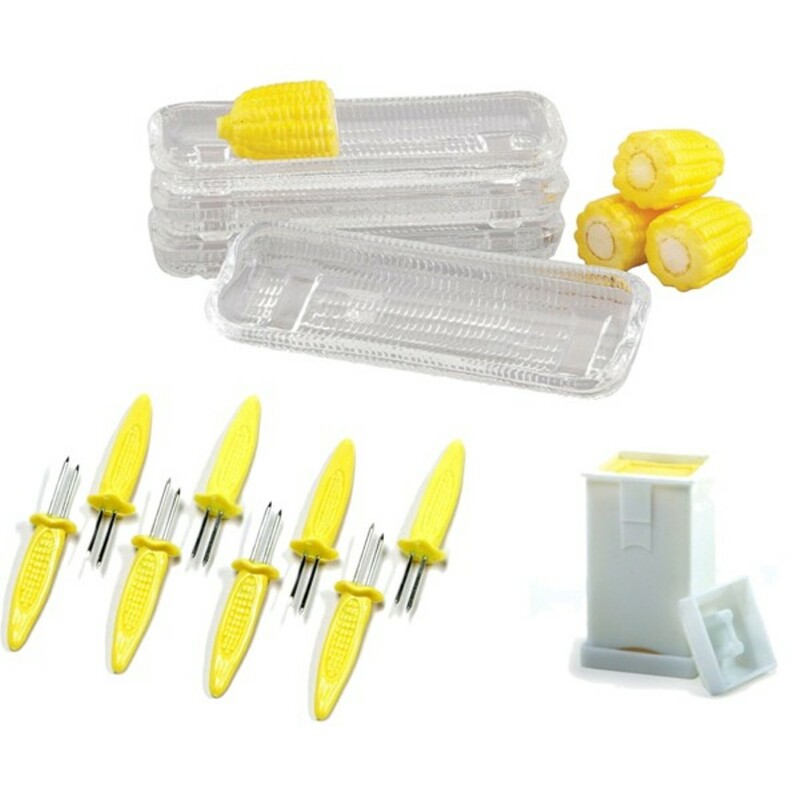 A combination of convenience and fun, this set of 4 glass corn dishes, 4 sets of corn cob holders and a convenient butter spreader, has everything you need for serving corn on the cob. The separate serving dishes make it easy to enjoy fresh sweet corn without sogging up other foods on the dinner plate and using these Corn on the Cob Skewers makes your corn-eating experience mess-free and much easier to manage. The butter spreader eliminates knives and mess and is easy and safe for children too. Glass Corn Butter Dishes are perfect for serving and enjoying delicious sweet corn on the cob without a buttery mess or the ears rolling away. They are made from pressed glass; sturdy and durable; and have a deeply curved shape that securely cradles even large ears of corn. Two prong skewers for corn on the cob have stainless steel pins and heat resistant plastic corn-cob contoured handles. Butter Dispenser quickly and easily spreads butter on bread, toast, pancakes, and waffles & is perfect for corn on the cob! Includes a cap to seal for storing. Dishwasher safe.